Be sure to visit Monnit in Booth# 1108 at Sensors Expo & Conference June 5-6, 2013 in Rosemont, IL. Las Vegas, NV and Salt Lake City, UT – May 21, 2013 – Monnit Corporation (www.monnit.com) announced today at CTIA 2013 the release of a new Machine-to- Machine oriented cellular gateway for use with wireless sensors. This gateway is specifically designed to respond to the increasing demand for a low-cost, reliable, “connect-from-anywhere”, monitoring solutions that addresses the needs of a variety of M2M applications. “The demand for cellular connected sensors is enormous. Monnit’s new cellular gateway provides a low-cost solution for those in need of remotely monitoring various aspects of their business, without the need of an existing internet connection.” said Brad Walters, CEO of Monnit. The MonnitLink™ Cellular Gateway model CGW2 is an advanced, all wireless, M2M gateway that enables fast time-to-market solutions for a wide range of M2M applications. 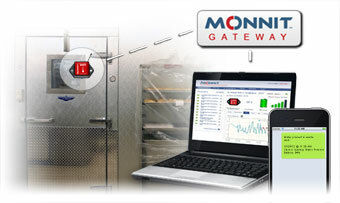 The gateway was designed to support Monnit sensors, which are capable of detecting and monitoring functions that are critical to business operations, including; temperature, humidity, water, light, access, movement and much more. Monnit’s wireless gateways transmit data between local sensor networks and iMonnit, the online data monitoring system, which aggregates sensor information and sends notifications via text or email if user defined conditions are met or exceeded. 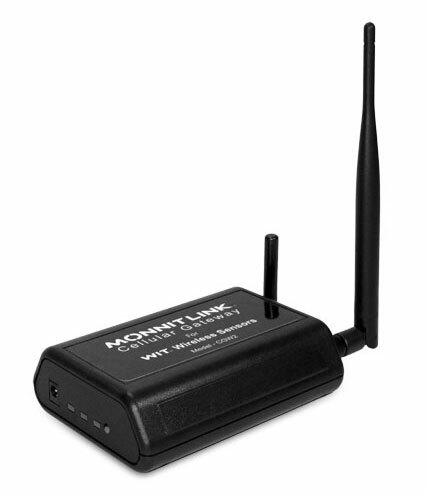 All Monnit wireless sensors include free basic iMonnit online sensor monitoring with SMS text and email alerting. The new cellular gateway is certified on Verizon’s CDMA cellular network and requires a low-cost cellular data. The new cellular gateway as well as sensors and monitoring software are also available to OEM’s and Reseller’s through a private label offering at www.oemsensors.com. The number of devices using a wireless internet connection is set to rise from 10 billion to 30 billion by 2020 as the ‘Internet of Everything’ (IoE) takes off, according to new data from ABI Research. “The emergence of standardized ultra-low power wireless technologies is one of the main enablers of the IoE, with semiconductor vendors and standards bodies at the forefront of the market push, helping to bring the IoE into reality,” said Peter Cooney, a practice director with ABI Research. Be sure to visit Monnit in Booth# 2937 at CTIA May 21-23, 2013 at the Sands Expo & Convention Center Las Vegas, NV. For more information on the show or to register, please visit www.ctia2013.com. The Global Wearable Wireless Sensor market is set to grow at a CAGR of 110 percent over the period 2011-2015. One of the key factors contributing to this market growth is the increasing focus on measurement and monitoring. The Global Wearable Wireless Sensor market has also been witnessing the preference for low-power wireless technology. However, the reduced clinician and patient acceptance could pose a challenge to the growth of this market. The market for disposable wireless medical body area network (MBAN) sensors within professional healthcare is in its earliest stages, but key foundations to support adoption are now in place. There is also tremendous potential for adoption. So much so that by 2018, close to 5 million disposable sensors will be shipped even though MBAN sensors will have barely penetrated the addressable market. MBAN sensors will enable patient monitoring information, such as temperature, to be collected automatically from a wearable thermometer sensor. These devices will improve patient monitoring detail and free up nursing staff to concentrate on other aspects of care. By achieving disposable form factors, MBAN sensors integrate especially well with the workflow of professional healthcare. Using Monnit wireless sensors provides peace of mind when it comes to knowing if your coolers are working properly. We recommend using Monnit’s wireless temperature sensors to monitor the operational temperatures of your walk-ins, as well as Monnit’s affordable wireless open/closed sensors to alert you if a cooler door has not closed all the way. Monnit’s single input pulse counters give you the choice of counting pulses or counting transitions.